PARAMARIBO, Feb 15 2019 (IPS) - High Forest Cover and Low Deforestation (HFLD) nations ended a major conference in Suriname on Thursday, with the Krutu of Paramaribo Joint Declaration on HFLD Climate Finance Mobilisation. Krutu—an indigenous Surinamese word—means a gathering of significance or a gathering of high dignitaries, resulting in something that is workable. “It is with great joy that I announce the adoption of the Krutu of Paramaribo Joint Declaration on HFLD Climate Finance Mobilisation,” Suriname’s President Desiré Delano Bouterse said. In the declaration, HFLD nations made several pledges, among them: to raise international recognition of the significant contribution that HFLD developing countries provide to the global response to climate change by enabling their forests to serve as vital carbon sinks, and look to the international community to provide adequate financial support to help maintain this treasure. For HFLD developing countries, nature and development are intrinsically connected, Bouterse said, adding they were all confronted with the threats from unsustainable activities, while attempting to plan a sustainable development. Bouterse said the challenge for these nations had been to find a development model that balances their national interests while continuing to deliver eco-services to the world. “I look forward to a united voice and innovative models that will shape our mutual interests. Suriname is honoured to have received the mandate to bring the HFLD developing countries’ effort to the international fora. We take this assignment very seriously and pledge our dedication,” the Suriname president said. Suriname was the first country that reserved vast amount of its land mass—11 percent—for conservation purposes, when it established the Central Suriname Nature Reserve in 1998. Bouterse said at that time Suriname had manoeuvred itself into a difficult position because almost half of its land was handed over to logging companies in the early 90s. However, he said that the strategic establishment of the Central Suriname Nature Reserve, with a total area of 1.6 million hectares, put an immediate halt to these activities. “This decision was specifically taken for protection reasons. A decision without even having the foresight of what this Nature Reserve’s intrinsic value would be in the years to come,” he said. “Now, 20 years later, we owe it to ourselves to evaluate and question the impacts of this decision. Are the ecosystems in the Nature Reserve intact or enhanced as originally intended? Meanwhile, Bouterse said Suriname will improve its legislation, align policies to their aspirations and improve even further. Suriname’s Minister for Foreign Affairs Yldiz Deborah Pollack-Beighle said the declaration represents a commitment that HFLD nations no longer will be the ones producing a solution to climate change and global warming without the required financial assistance. “The conversation needs to change, and it should be that we should be paid for maintain or our forests,” Pollack-Beighle told IPS. She said at the end of the day, it’s the people of HFLD nations that will benefit from the three days of talks. The Krutu Declaration will result in tangible benefits for the communities that are living and are resident in these forested areas, Pollack-Beighle said, adding that the countries as a whole will also benefit. 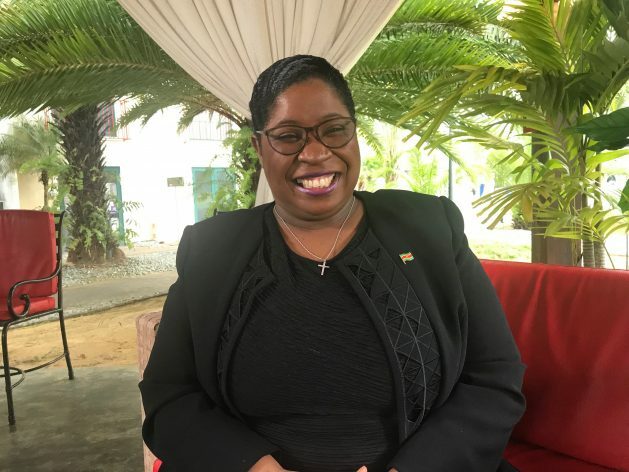 “For Suriname, we need to arrive at the point where we will no longer have to beg for the fact that we have presented the world with a solution, but we will be sought out and provided with opportunities that are existing,” she said. “We are leaving here with a commitment that needs to translate itself in such a way that . . . we see significant changes immediately after this conference. “Suriname has been given the role of advocate and champion to make sure that this declaration finds its way at the highest level of the global agenda, bilateral agendas, but also the regional agenda,” Pollack-Beighle added.